This is a drop-dead gorgeous blouse. 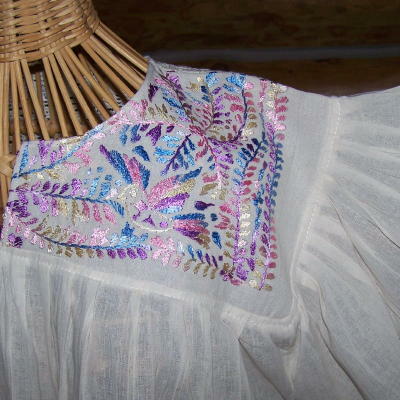 The hand-embroidered yoke is done with silk thread in shades from pink and lavender to blue. 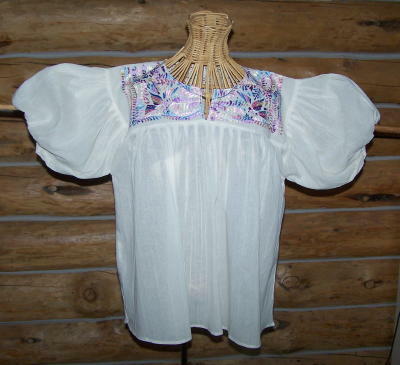 This is a gauzy blouse and will require a camisole or skin tone bra. The inset sleeves allow for LOTS of room and comfort. The light-weight will also make it really cool for summer. The same silk thread is used on all of the shirts, but the colors vary slightlyy. This blouse is now available in 2 sizes, a small-medium, and a large-XL. hip "opening" seems large, the gathers are very tight. Sleeves are deep-inset.